The McLaren MP4/7A was the follow-up of the successful MP4/6 from the 1991 season. McLaren planned that the all-new MP4/7A would make its debut during the fourth race of the season, the Spanish Grand Prix. But due to the speed of the Williams car during pre-season testing, Ron Dennis decided to bring out the new car one race earlier at Brazil, one month earlier than previously planned. The MP4/7A was the first McLaren with a semi-automatic transmission. The tranmission was a McLaren-designed electro-hydraulic unit with semi-automatic activation. The new system allowed the drivers to keep their foot on the pedal as the throttle cable was replaced with an electronic sensor. It also contolled the engine speed automatically during gear changes. 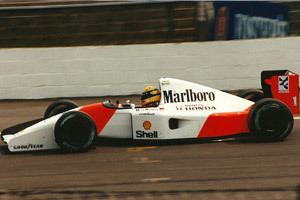 The McLaren team was unable to win the Constructors' or Drivers' Championship in 1992 but collected five Grand Prix victories. Three for Ayrton Senna and two for team mate Gerhard Berger.